No, no…I’m not getting into trouble. I’m just *making* things. 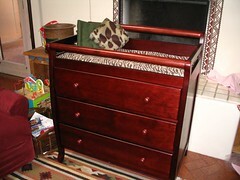 After debating what to get/use for a changing table for baby #2 (I’d sold the one I had for Maya, but still have the crib), we picked out a dresser-changer combo. It arrived, and in a flurry of do-it-yourselfiness, I got it assembled. It’s lovely. BUT…the pad is NOT a standard size. Standard pads are 33″x16″. This one is 34-1/2″x17-3/4″. D’oh. Now I’m patting myself on the back. For around $40 (less than I would have spent on pre-made covers that wouldn’t fit anyway), I made three custom-fitted pad covers AND a rather large hand-knotted fleece blanket. So there. Pity the flash and camera don’t do the colors justice. 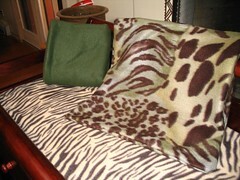 The non-brown sections of the varied animal print fabric range from sage to olive to a slight aqua tinge. Yeah, I know. Such animals don’t exist in nature. Eh, the colors are killer, and the fabric looks great with the crib bedding set I got (another of Maya’s things I’d sold, not expecting to get to have another baby so soon). The zebra print is cream/light beige and dark brown rather than black and white. All in all, the colors are great — JoAnn Fabric served me well. 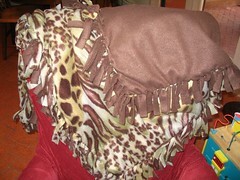 Now, Maya says that absolutely, she wants a blanket like the knotted one I made for baby. Guess we’re going back shopping, and we’ll make her a blanket that will come in handy when we’re traveling across the Atlantic in a couple months! And, since no photo shoot is done without pics of Maya (”Mama, let me see Maya!”), here’s my pj-attired kiddo this morning, complete with smile for the camera. Can you tell what we’ve been doing around here? Yesterday, after watching Cinderella yet again, Maya started calling me “Mother.” As in, the way Grisella or Anastasia might say it. This morning, she asked me to talk like stepmother. I’d find it outright disturbing, except that this morning, when Maya was play-acting to be me, I asked her what Mama says. “Mmmm. I’m cooking and making eggs and cheese for Maya.” So, I guess I’m not entirely evil. Yet. We’ve gone cold turkey on diapers, as of Friday, November 2. This is technically round 2 of CT, but the first time, I allowed (okay, required) pullups and/or diapers at night. Now, we’re entirely without. So far, two poopy pants (one per day, ick), and one wet bed, but no wet accidents during the daytime. Maya has been informed that princesses do *not* poop in their pants, and once she poops in the potty instead, she can resume her pink sparkly dress-up time. Cruel, perhaps, but the heart of training is learning what motivates the trainee. And that dress is *quite* motivating. I’m late mentioning this — here, at least — but looking below, I realized I’ve never formally announced that Mike and I are expecting baby #2 in mid-March 2008! We learned last month that Baby 2 is a boy, and it’s been a blast preparing. 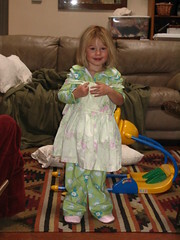 Fortunately, I have some fab friends who provided hand-me-downs to make the wardrobe needs less painful. As my part in the Karma train, I passed Maya’s NB/0/3/6 clothing on to Mike’s sister, who’s scheduled to have her second — a baby girl, of course — in 8 days. Wow! Just a week left! We figure if we ever have another, we’ll deal with it then…but since we have no idea whether that child will ever exist, much less be a girl, it would be silly to hold onto clothing that our family could use instead! Final update for this post: we finally know some more details about our move. Oh, I haven’t mentioned that either, have I? We expect to move to Vienna, Austria within the next two months, and by this time next week, we should have more of the details from Mike’s employer-to-be. It’s a bit intimidating to move to a country where English isn’t the primary language (and I don’t know German at all! ), but it should be a fun adventure for all of us. 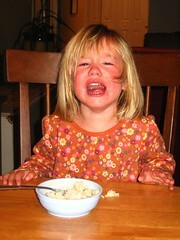 Last thoughts: It’s coming to be time to phase out this blog (but keep the domain, of course, for Maya’s future use! ), and move to a family site, especially with the new addition and move to Europe. I’m toying around with site names, but haven’t really hit on anything I love yet. It’s entirely possible that I’ll repurpose my personal blog as a family blog…but we’ll see. Then, I’d have to decide what (if anything) to do with all those not-so-subtle posts that dig inside my head, huh? The emotional rollercoaster of three is unlike anything I’ve ever encountered. We missed out on Trick-or-Treating (as IF Maya needs more sweets? ), but did indulge in a princess dress. 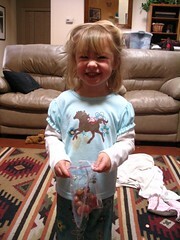 Maya was in preschooler heaven. She spun in circles. She admired her sparkle shoes. She asked me to dance with her during the waltz in Cinderella. Then it was time for bed. Uh-oh. For what it’s worth, this happened TWO nights in a row. Two. 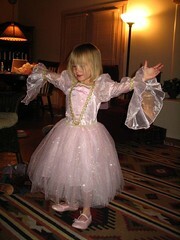 As in, both nights that she got to wear the princess dress. I’ve warned her that if she eternally makes this so hard for me, she won’t get to wear it at all! And, this morning, she’s a sane human being again. Or was, at least, until I asked her to wait while I finish writing a story about her. The Princess Bride. In the past few days, Maya has decided that she has no use for The Wiggles, but that Westley and Buttercup are her new best buds. Guess I should pick up some Monty Python to see if she’ll dig that, too. The drawer where I keep Maya’s dresses is well within her reach. 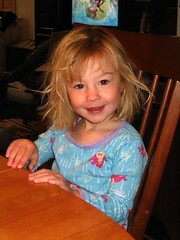 The past few mornings, she’s grabbed a dress and pulled it on (usually inside out and/or backwards) over her jammies. Me: Maya, let’s do something else. Mama’s tired of that movie. How about Toy Story? I can’t complain. She comes by it honestly. Me: Sure, you can have an apple. Guess it DOES still taste okay when chopped up. I’ve never been particularly cautious about pre-washing Maya’s new clothing, but when I bought a bunch of new 3T pjs and whatnot last week, I washed every single piece, because my gut said so. The dress Maya wore today, however, wasn’t part of that purchase; it had been sitting in the back of the closet for months, unworn. This morning, when Maya asked for it (I’d left it sitting out in the room), I thought, “no problem,” and pulled off the tags. Mistake. When I picked her up from school today, I immediately notice a patchy bumpy rash on one shoulder. On examination, I noticed it was EVERYWHERE that the knit portion of the dress had touched. A shower and hydro cortisone later…she’s less itchy and heading to bed. That’s the first contact rash she’s gotten since long ago when I discovered that Pampers were a very bad idea (due to their perfume content). SIGH. This is what happens when I let Maya choose her own clothing in the morning. Purple dress? Purple dress? You want to wear this dress, Maya? Note that her sunglasses are pink. She chose those too, over the tortoiseshell ones I suggested. 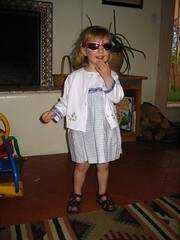 Like it or not, I am most definitely the parent of a GIRLIE GIRL. Have a comment? Please leave it! I want to know what you're thinking, whether I agree or not. I moderate all new commenters and reserve the right to delete anything that is off-topic, abusive, or simply annoying. Don't like that policy? You're welcome to create your own site, where you can bash me or others as you like. Spam comments are moderated, then deleted, so don't bother posting. They won't appear here. based on Daisy Rae Gemini developed by Root designed by geeksmakemehot.